LFCTV have released another video in the Bezzies series—this time starring Alex Oxlade-Chamberlain and Rhian Brewster. The duo have been sidelined throughout the season so far and have struck up a keen friendship during their respective rehabilitations. Midfielder Oxlade-Chamberlain damaged knee ligaments last term against AS Roma in the Champions League, but is now on the comeback trail in training and could return earlier than expected this term. Brewster, meanwhile, suffered ankle and knee worries and needed two surgeries last term and was hoping for a return to action around the New Year period, but will now likely be sidelined all season long. Now the two have come together as the latest collaborating pair on the Bezzies series, which has previously seen the likes of Alisson and Roberto Firmino together and James Milner with Andy Robertson. In the video, we hear about Brewster’s penchant for singing in the shower and Oxlade-Chamberlain’s wardrobe habits, both of which delay them when getting ready! 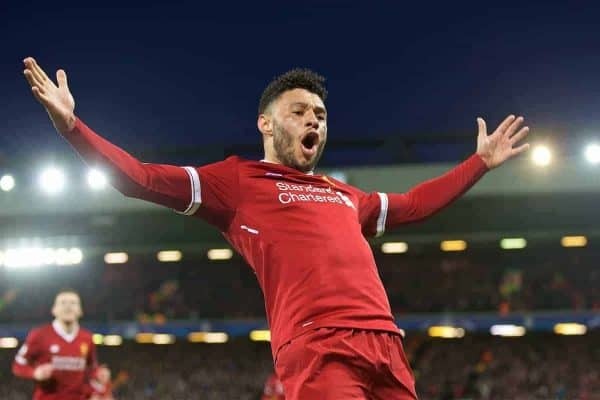 One revelation from the young striker and his favourite feature about himself prompts an hilarious outburst from Oxlade-Chamberlain, who claims his younger counterpart lacks “the Ox beef” to be proud of having muscles to flex. We also learn the worst habit of Brewster—and find out whether or not his team-mate can sing all the words to Kop anthem Allez Allez Allez. “There’s a bit of a bromance going on here,” says the elder toward the end of the clip—before revealing it’s the younger of the two who is constantly acting the big brother! It’s another great insight into the inner-workings of the squad and the closeness within, and doubtless both will be delighted for the other when they finally return to action.